After a fulfilling and hectic Marghazhi, crowned with five awards/titles, Sudha’s musical diary gave space for some assorted activities in the months of February and March 2009. February 2009 saw her outside of town, at Hyderabad and Bengalooru for some memorable concerts, catering to her affectionate rasikas. There were also visits to Isha Foundation to be with Sadhguru, the faculty and guests for some intellectually stimulating activities. A snapshot of the same can also be viewed in the menu ‘Shradhha’in this website. 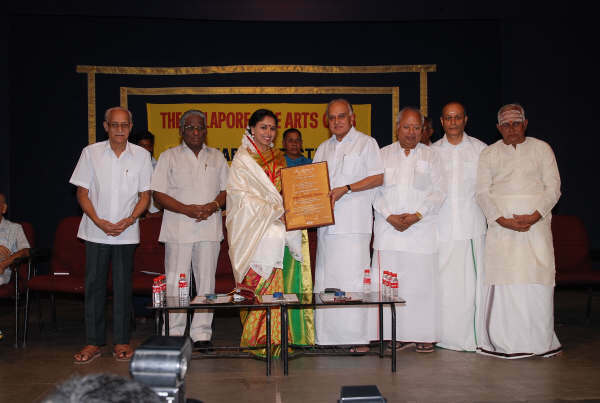 March 2009, for Sudha, began with a rush trip to Bengalooru, to don yet another title, Sangeetha Ratna, conferred on her by Geethanjali, in memory of Bharat Ratna, Ms. Subbulakshmi. On 9 March, Sudha participated in a workshop ‘Women in a changing world – challenges & opportunities’, organized by the Centre for Women’s advancement, Sri Ramachandra University. On 22 March the Festival organized by Sri Shanmukhanandha Sabha, held at the Tamil Sangam auditorium, Delhi had Sudha performing for the grand finale. A rasika comments, … “The two and a half hour concert was a magical spell of delectable music. Even Lord Anjaneya – who is supposed to be present in some corner wherever some good music is on, would have found it difficult to find a free corner in the Hall due to the overflow of the enthusiastic crowd of rasikas”. Her involvement with causes and her helping hand through her Samudhaaya Foundation saw Sudha attending a function at the B V S N Murthy Centre for Special Children, a unit of Primary Health Centre, on 28 March. Sudha truly believes in this quote “Life does not have to be perfect to be wonderful.” – Annette Funicello. There is beauty everywhere and after all that we manage to package in each day of our busy lives, there is always time for those little gestures that bring great happiness to our hearts. Special moments with special children!